You’re having a conversation with someone and suddenly his eyes drop to his smartphone or drift over your shoulder toward someone else. 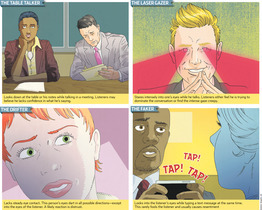 It feels like this is happening more than ever—in meetings, at the dinner table, even at intimate cocktail parties—and there are signs that the decline of eye contact is a growing problem. Adults make eye contact between 30% and 60% of the time in an average conversation, says the communications-analytics company Quantified Impressions. But the Austin, Texas, company says people should be making eye contact 60% to 70% of the time to create a sense of emotional connection, according to its analysis of 3,000 people speaking to individuals and groups.